Item is a photograph of the Ayer's Cliff championship hockey team, who beat the team from Aylmer for the title. Item is a photograph of a car parked down by the Ripple Cove public beach in Ayer's Cliff. Item is a photograph of a Cushing man next to a deer that he killed while hunting. The item is a photograph of athletes, young men, of Bishop's College School in Lennoxville in the early 1900s. Photograph of men playing rugby. Photograph of probably a men's gymnastics team. Group photograph of probably a men's gymnastics team. 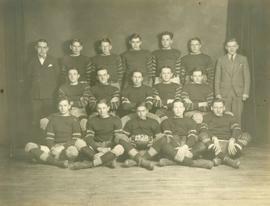 Group photograph of hockey team, probably from Bishop's University, ca. 1910. Group photograph of people playing baseball. Photograph of a group of skiers and snowshoers about to race on Bishop's University field in Lennoxville from the early 1900s. Item is a photograph of three men sitting at a hunting camp near Indian Stream in the state of New Hampshire, close to the Canadian border. Item is a photograph of a row boat on Wallace Pond (near Frontier Lodge), with a tent and woods visible behind it. 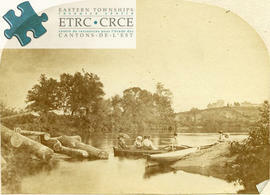 Item is a photograph of Henry Parsons holding a fish beside Wallace Pond (near Frontier Lodge) with a boat on it. Item is a photograph of two hunters (Edward Wright of Dixville and Archie [?] Wood of Hereford) beside a deer, which is hanging upside down. Item is a photograph of Little Lake Magog Cove, with surrounding landscape visible. Item is a photograph of the Sherbrooke Country Club, and the surrounding landscape. Item is a photograph of a postcard showing the horse track and grounds of the Ayer's Cliff exhibition grounds. The is a photograph of a group of boys outside the Lynx Patrol's Boy Scout Camp near Sherbrooke from around the 1920s. The item is a photograph of William J. Hunt, Doris Barclay, C.H. Bowen, Will Barclay, Florence Hunt and Ruby Hunt at the St. Francis Golf Links, in Sherbrooke from around the 1920s.